WordPress comments got out of hand? I recently had to fix a client’s WordPress site that had completely got out of hand. The problem started when they set comments to auto-approve and never bothered to setup Askimet. 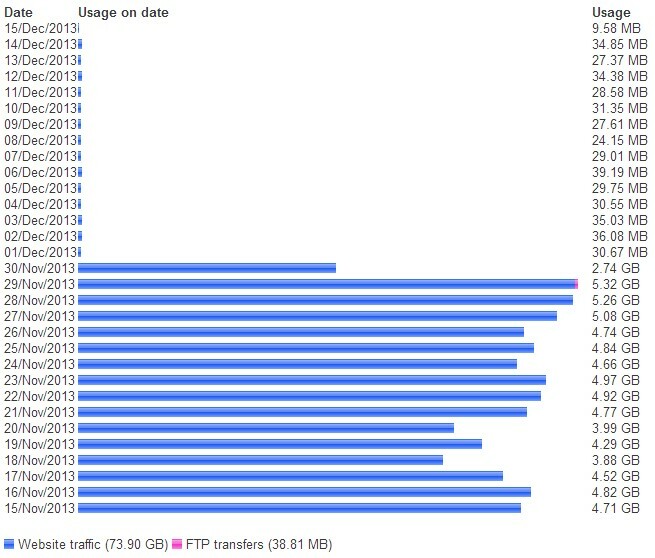 For well over a fortnight this website was using around 4GB+ of bandwidth a day! Look at the difference after the comments were disabled and removed. Back to about 30MB a day of bandwidth after discovering the issue on the 30th of November. Anyone who has ever gone through this will tell you once the damage has been done, it’s too late to run over to Askimet to save you. So how do you get rid of bulk comments? Answer: PHPMyAdmin. That should remove most of the spam. You may also need to run one for https:// links. You could also use this query to remove comments with Russian or Chinese symbols etc. I also would run another query for the people commenting and adding their website URL. Warning this could delete non-spam comments but you have to weigh up what is more important, the time it would manually take to remove them vs the non-spam comments lost. It can be a bit of trial and error to whittle away the spam comments but it will restore your blog from being targeted by spammers.